Charles M. Holbert was referred to as the "Old Man of the Mountain". He was SoMo's first park custodian starting in Feb of 1929, lasting ten years. He said he explored every inch of the park be it on foot or on horse, and felt responsible of all who wandered in the South Mountains. In 1958 a lookout point was named in his honor. Spring of '88 brought a proposal for an aerial tramway near the Holbert area as reported by Phoenix New Times. Phoenix Gazette reported it as a gondola. While not much of an ascent a restaurant up top was sure to lure. The TV towers would have been removed and Summit Road closed. Just a proposal. An amphitheatre proposed near the entrance caused the most ruckus. This trail has a great mixture of scenery and a moderate grade. Keep an eye out for rock art, especially the rare waterbirds. This description is from the trailhead at the lower end to the upper southern end. Parking is never a problem. On occasion, Horseback riders from the local outfitter are seen within the first five minutes. From the trailhead be on the lookout for petroglyphs on the dark boulders in the first quarter mile. Soon you cross an area used for cookouts. The trail is pretty flat for almost a half mile. 0.50 mile Follow briefly alongside a paved road to a tank 0.6 mi. The grade increases for about 1/4 mile, leaving evidence of civilization. After a few long and lazy switchbacks city views open up. Then you reach a saddle and follow along the upper part of a wash with a small box canyon at the end. The trail zig zags out of the canyon near Duckbill Rock. The pain of ascending feels like it's over as the trail dips through a wash and the grade eases until you cross summit road at 2.05 mi. The final stretch offers great views of the Valley. With exception of busy weekends in season it is quiet and surreal. The trail ends at 2.4 mi where it intersects Summit Road the second time as a "T" junction with the National Trail. The three personalities of this trail get better with each step. The flat stroll through petroglyph alley does show signs of overuse. Bring a pair of binoculars to check the higher rocks for petroglyphs. The canyon midway is probably the most loved. Past Dobbins is my favorite. Views from the Four Peaks to the Estrella Range along with downtown Phoenix get me everytime. Most notably the silence of the surrounding city. Birds chirping, squirrel calls and even coasting bicycles all captivate with their crisp distinctive sounds. Enter South Mountain Park from Central Avenue. 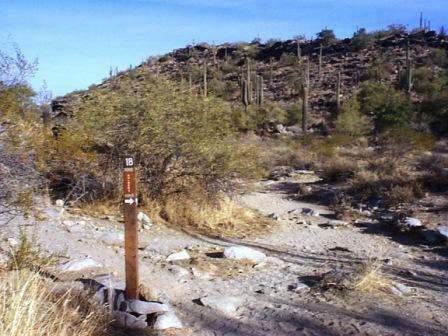 Just past the first guard gate, turn left toward the South Mountain Educational Center, and proceed East about 1/4 mile to the marked trailhead.